While we’ve added our most popular widgets to the home page, we know you want to have them deliver the ratings you want to see most. So we’ve made it possible for you to do a little customization. Click on our logo or the “Home” tab in the navigation bar to get to the Home page. 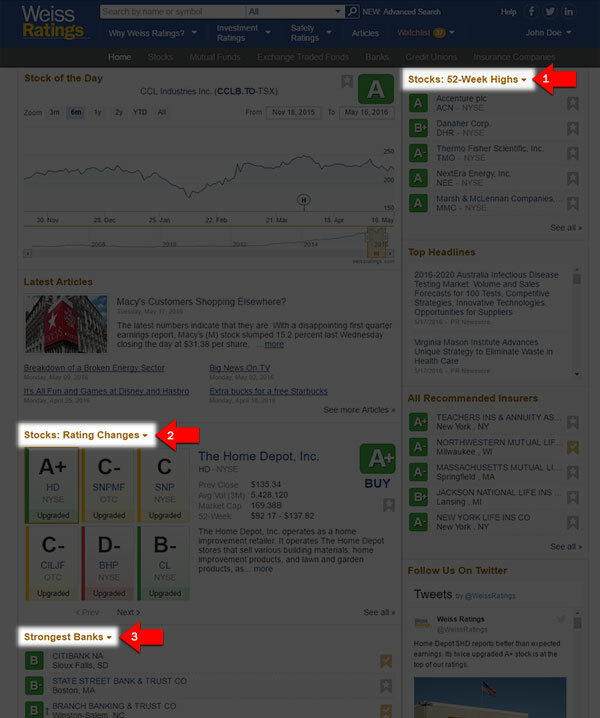 There are three widgets you can customize, and they are titled “Stocks: 52-Week Highs” (arrow 1), “Stocks: Rating Changes” (arrow 2), and “Strongest Banks” (arrow 3). You’ll notice a small down arrow next to each of those titles. Simply click the arrow and you’ll see the options for customizing that widget. Make your selection by clicking on it, and the content of that widget will automatically update. And that’s it. We’ll remember what criteria you selected and it will always deliver that information for you, anytime you return to the Home page. Or until you change it again.